[toc]Fibroids are often described as non cancerous tumors originating in the uterus of a female. These fibroids are made of smooth muscles which line the uterus and can be of various shapes and sizes. Fibroids usually develop in the uterus of females during childbearing age and often disappear after pregnancy. Some women having fibroids may not experience any symptoms. Whereas other are known to often experience painful menses, heavy bleeding during periods, constipation, increase in urination frequency, pain etc. There is no definite known cause of fibroid formation, however some factors which increase the chances of females developing fibroids are genetic factors, imbalance of estrogen hormone, alcohol consumption, high blood pressure, uterine infections, starting periods earlier than 10 years etc. Fibroids are known to decrease and sometimes altogether disappear with the start of menopause, when there is decreased levels of estrogen in the body. Fibroids are treated with help of medicines and surgery. Below mentioned are some useful herbs which help in shrinking the fibroids naturally and prevent them from reappearing. Milk Thistle is one of the most important herbal remedies available for shrinking and preventing formation of fibroids. Silymarin is one of the main components of Milk Thistle which help in regulating the functioning of Liver. It helps in eliminating excess estrogen from the body, thereby helping in shrinking the existing fibroids and preventing the formation of new fibroids in the uterine cavity. Milk thistle is a very famous uterine tonic and is responsible for maintaining overall health of the female reproductive tract. Milk thistle is available in form of capsules, extracts, tonics, tincture etc. Yellow dock is another very useful herbal remedy for treating fibroids in females. Yellow dock helps in stimulating the functioning of the liver and helps in production of more bile juice for better digestion. It also helps in regulating the hormonal balance in the body by metabolizing excess estrogen in the body, which causes fibroids. Yellow dock is also a very good naturally found astringent, which helps in controlling excess menstrual bleeding caused by presence of fibroids in the uterine cavity. The root of Yellow dock is rich in medicinal properties and can be consumed internally in form of capsules, tincture, tonic etc. It can also be brewed into herbal tea and consumed for shrinking fibroids. Dandelion has been used traditionally by women to cure many problems related to the reproductive tract, including fibroids. Dandelion is very useful liver tonic and stimulates the better functioning of the liver. It helps in eliminating toxins and excess estrogen hormone from the body, thereby helping to shrink the existing fibroids in the uterine cavity and prevent them from re-appearing. Dandelion is also very effective in reducing pain and excess bleeding during menstrual cycle, which are the main symptoms of fibroids. Dandelion helps in maintaining a healthy hormonal balance in the body and can be easily consumed in form of herbal tea. It is very bitter in taste and can also be consumed internally in form of capsules, extracts, tonic etc., to provide relief from fibroids. Vitex is a renowned and effective herbal remedy available for female problems, including fibroids. Vitex is one of the best female tonics known to man. It helps in regularizing the balance of hormones, namely estrogen and progesterone, in the body which cause fibroids. Using Vitex regularly helps in slowing the growth of fibroids and brings hormonal balance in the body. Vitex can be consumed internally in form of capsules, extract, herbal tea, tonics etc., to get relief from the problem of fibroids and its related symptoms of excess menstrual bleeding, painful menstruation,infertility etc. Siberian Ginseng has been used by Chinese people as an effective herbal remedy for curing and preventing uterine fibroids. Siberian Ginseng is renowned for its adaptogenic properties, which help in maintaining a balance of hormones in the body. It is very effective in regulating the functioning of adrenal glands and helps in it recover from fatigue caused due to stress. All these properties of Siberian Ginseng help in shrinking fibroids and prevent them from re-occurring. The root of Siberian Ginseng is rich in medicinal properties and can be consumed internally in form of capsules, dried root powder, extract, tonic etc. Goldenseal has been used since centuries to boost the overall immunity of the body, which in turn helps in treating and preventing the occurrence of fibroids in the uterine cavity. Goldenseal is bitter in taste and very effective in regulating the functioning of the liver. This effectively eliminates excess estrogen from the body, thereby helping in shrinking fibroids. Goldenseal is also very effective in maintaining overall healthy uterine cavity and can be consumed internally in form of capsules, extract, tincture etc. It can also be brewed into herbal tea and consumed for providing relief against fibroids and its related symptoms. Licorice is yet another herbal remedy used widely by Chinese people effectively to treat fibroids. Licorice helps in regulating the adrenal gland functioning in the body, which in turn regulates the level of estrogen hormone in the body. 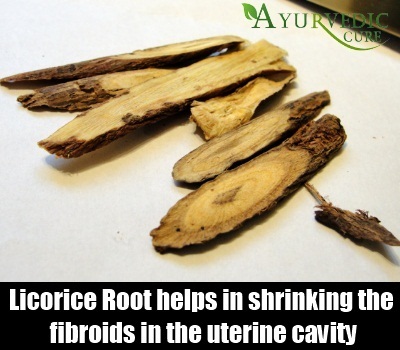 This effectively helps in shrinking the fibroids and prevents them from occurring again in the uterine cavity. Licorice is also used to reduce inflammation and regulate the hormonal balance in the body. Licorice root is the powerhouse of medicinal properties and can be consumed internally in form of herbal tea, dried powder, extract, capsules, tincture etc. Don Quai is another very popular Chinese herbal remedy used for curing various female reproductive tract related problems, including fibroids. Dong Quai is very effective in maintaining the balance of estrogen hormone in the body, thus helping in shrinking of fibroids. It also helps in supporting the functioning of the liver, by removing toxins and excess estrogen from the body. Dong Quai is also very effective in providing relief from symptoms of fibroids like heavy menstrual bleeding, pain during menses, irregularity of menstrual cycle etc. Consuming Dong Quai regularly helps in strengthening the immune system of the body and prevents the occurrence of fibroids. the root of Dong Quai is rich in medicinal properties and is available in form of tincture, tonic, capsules, extract etc.